MythBusters is a science entertainment television program which airs on the Discovery Channel. It stars Jamie Hyneman and Adam Savage. In the program, Hyneman and Savage use scientific methods to test the validity of rumors, urban legends, adages, movie and television scenes, and Internet videos, collectively referred to on the show as "myths". After testing, they determine each myth to be "Confirmed", "Plausible", or "Busted". They occasionally re-test a myth if audience feedback uncovers a flaw in their testing or if new information emerges about the myth. "Toilet Bomb": Whether a cherry bomb flushed down a school toilet will make water shoot out of all the toilets in a geyser-like effect when it explodes, in reference to a prank Bart pulled in "The Crepes of Wrath". "Homer Wrecker": Whether placing a person between a wrecking ball and a building will protect the building, in reference to a scene from "Sideshow Bob Roberts" where Homer clung to a 5,000-pound wrecking ball to prevent the Simpson home from being demolished. Al Jean served as a consultant and guest star for the episode. Matt Groening, Al Jean and Michael Price received a special thanks for the episode. Savage built a half-sized replica of a three-toilet system. He then did several test explosions, using a blast of compressed air to simulate an exploding cherry bomb (the segment presented several disclaimers that cherry bombs are illegal). Savage found that he could achieve the geyser effect if the explosion took place at a low point in the system and the pipes were full of water, as would happen if there were a clog. Savage and Hyneman then moved on to a full-scale test, again building a three-toilet system. To generate the explosions, they used a black-powder device with explosive potential similar to that of a cherry bomb. First, they confirmed that the fuse would continue to burn underwater by detonating a bomb in a bucket of water. Then they proceeded with the full-scale test, placing the bomb at a low point in the system and filling the pipes with water, as in the half-scale test. The explosion produced the geyser effect, but also blew the toilets off their mountings (in "The Crepes of Wrath", the toilets stayed in place). They reinforced the mountings (bolting the toilets directly to the pipes) and made another attempt, but got the same result. Based on these tests, they determined the myth to be busted, as an explosion powerful enough to produce the geyser effect would also blow the toilets off their mountings and/or destroy them outright. Al Jean, however, countered by saying that since Springfield Elementary School is located close to a nuclear power plant run by idiots, the toilets are "ultra super reinforced". Savage constructed a life-sized human analogue of Homer Simpson, using data from the show to determine Homer's height, proportions and body composition. 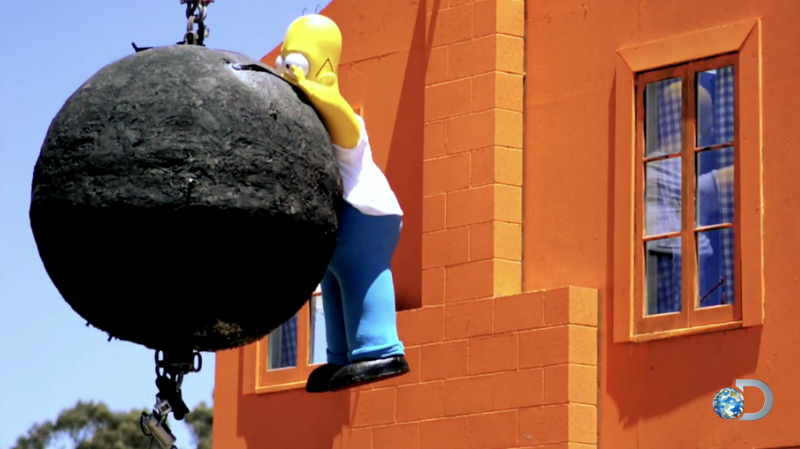 Hyneman, meantime, built a wrecking ball out of steel-reinforced concrete so it could be Homer's size, as seen in "Sideshow Bob Roberts", and still weigh only 5,000 pounds (an all-metal wrecking ball of that weight would be much smaller than Homer, and an all-metal wrecking ball of Homer's size would be much heavier than 5,000 pounds). After that, they built two house end walls and were ready to conduct the test. Hyneman and Savage set up the wrecking ball to have one swing at each house. For one house, they used the ball by itself; for the other, they attached the Homer analogue to the ball so it would be between the house and the ball. Without the Homer analogue, the ball did severe damage to the house, buckling the wall and breaking off part of the chimney. With the Homer analogue, the wall visibly flexed and bent but was much less damaged. Based on these results, Hyneman and Savage determined the "Homer Wrecker" myth to be plausible. Several clips from The Simpsons television episodes were shown all through the episode. Clips of Hyneman's and Savage's animated counterparts in the episode "The Daughter Also Rises" were shown. Early in the Toilet Bomb test, Savage announced that he was forced to use compressed air for the half-scale test, as Hyneman flatly refused to allow explosives to be detonated inside the building. Savage wrote "I Will Not Set off Cherry Bombs In The Shop" on a blackboard, referencing the chalkboard gag. 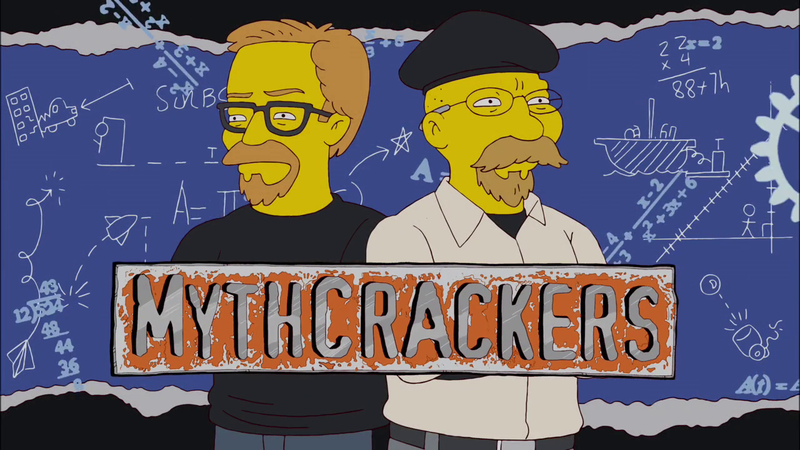 In the season 23 episode "The Daughter Also Rises", a parody of MythBusters, titled MythCrackers was shown on TV. It was also hosted by Jamie Hyneman and Adam Savage. Modified on January 27, 2015, at 11:03.